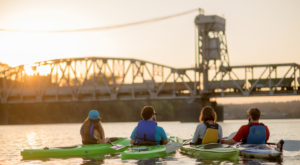 Most of Arkansas’ natural beauty is easy to spot as soon as you step outside; however, some of the state’s hidden treasures take a bit of effort. 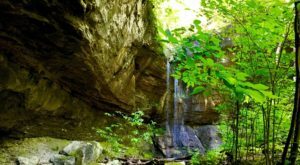 This side-trip from the Ozark Highlands Trail is well worth the exertion to reach not one, but two lovely waterfalls. 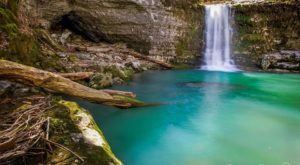 Let’s map out this adventure to reach the gorgeous Punchbowl Falls. 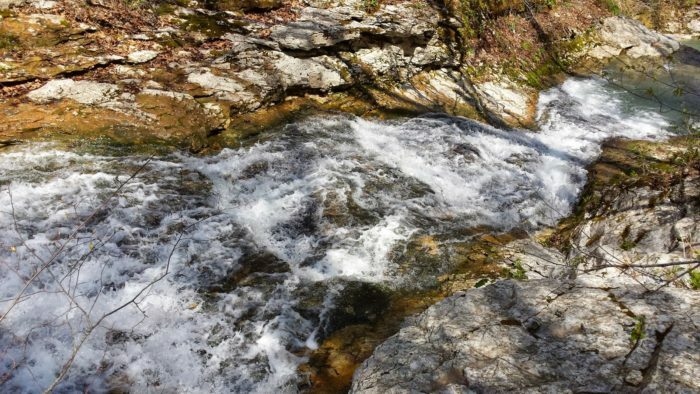 This hike is not recommended for young children or inexperienced hikers. 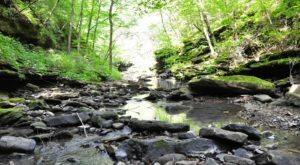 We have plenty of 1 mile and under hikes for the whole family or a different waterfall trail that’s more accessible. 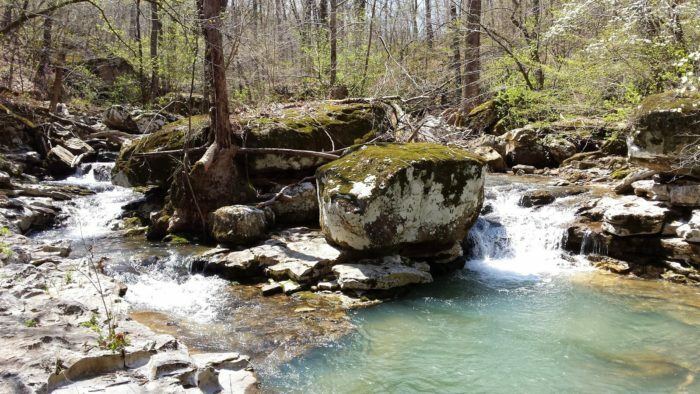 Today's hike is a side-tracked adventure off of the Ozark Highlands Trail. 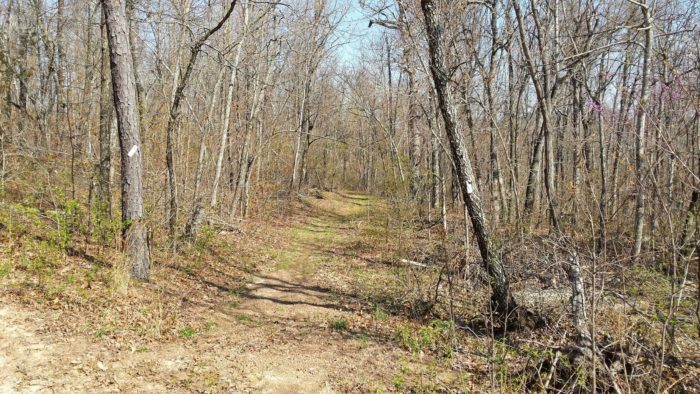 The Ozark Highlands Trail (OHT) is a spectacular 165-mile (and still growing) hike from Lake Fort Smith to Woolum. 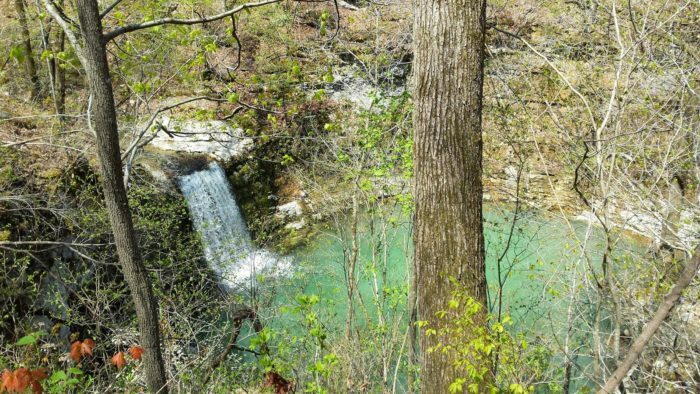 While the entire trail is the ultimate entry for any Arkansas bucket list, the OHT can be divided into more feasible day-hike portions. We'll be starting our excursion at the Stack Rock Trailhead, which is about 30 minutes west of Snowball. Here are the coordinates for the Stack Rock Trailhead Parking. Our hike begins easily enough. After parking, head north along the OHT. One great thing about the OHT is that it's well marked with white metal tags. 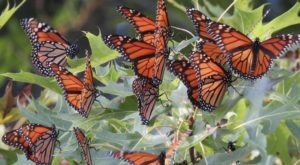 The trail is well-kept, too. 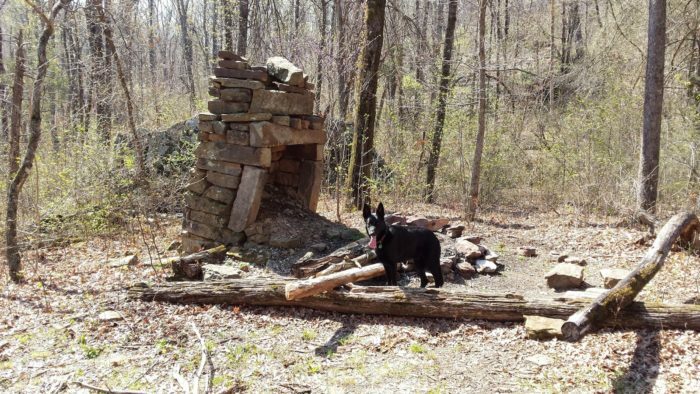 After hiking for just under a mile, we'll come across the remains of a pioneer homestead. 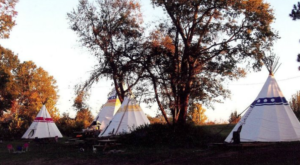 The homestead is just to the left of the trail. Seeing the stacked rock chimney means we're close to our first waterfall, the Stack Rock Homestead Falls. From the homestead, across to the right side of the trail, will be Dry Creek. The name is rather misleading since you'll be able to hear it running from the trail. Follow the creek down for a few yards to reach our first waterfall, Stack Rock Homestead Falls. You'll come out to the top of the waterfall. You can climb down for a better view, too. Just be careful of the slippery rocks! We'll follow the creek for 0.7-miles until we've reached the top of Punchbowl Falls. 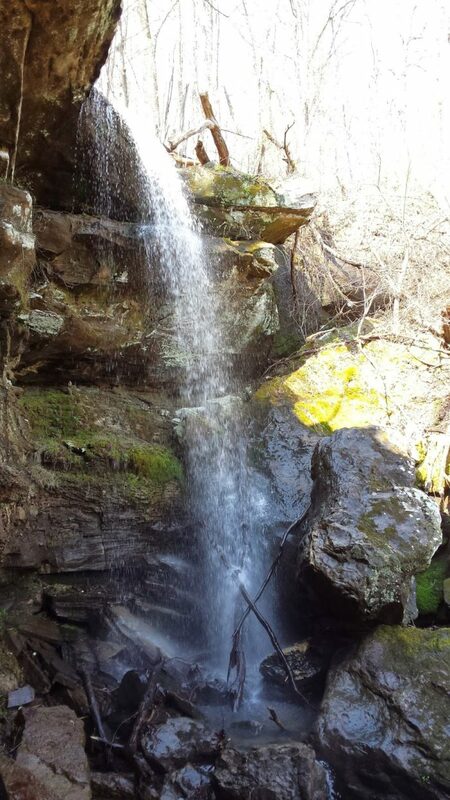 The waterfall used to be called Dry Creek Falls but the name was changed in 2006. The new name is definitely more fitting. Again be very careful of the rocks, but you can clamber down the the base of the falls for a better view. 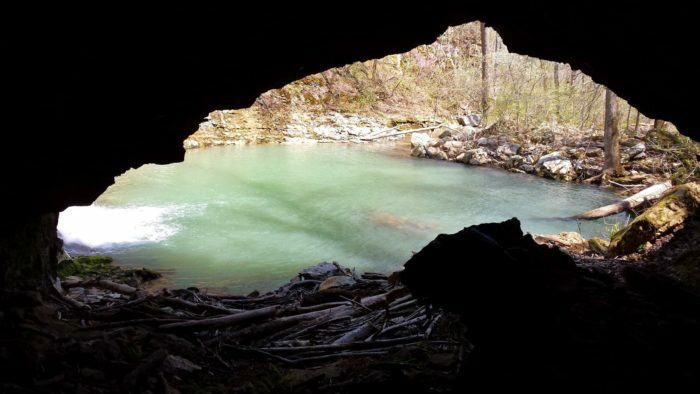 There's also a cave near the base of the falls that's perfect for break time. 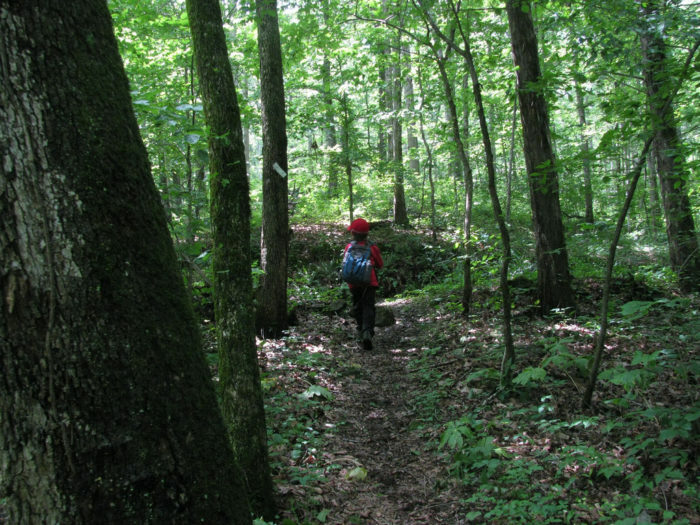 The hike back will be uphill so be sure to catch your breath and stay hydrated. We did it! Punchbowl Falls is an unbelievably beautiful spot that's well worth the effort. The hike to Punchbowl is 2.7 miles, so 5.4 miles round-trip. Bring your GPS and use these coordinates to help navigate between the parking area, homestead and two falls. 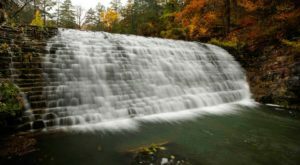 For more detailed directions on this trip we suggest visiting Rick’s Hiking Blog or reading Tim Ernst’s Arkansas Waterfalls Guidebook. Have you been to Punchbowl Falls? 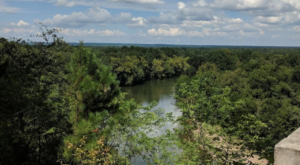 We would love to hear about your hike and see your pictures in our Facebook Group, Arkansas Nature Lovers! 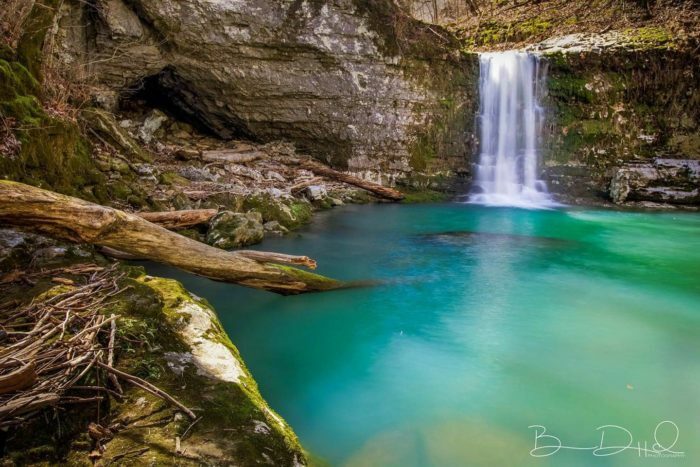 You should join for your chance to be featured (like Brennan Duffield today) and to discover why there’s nothing better than Arkansas’ stunning nature. 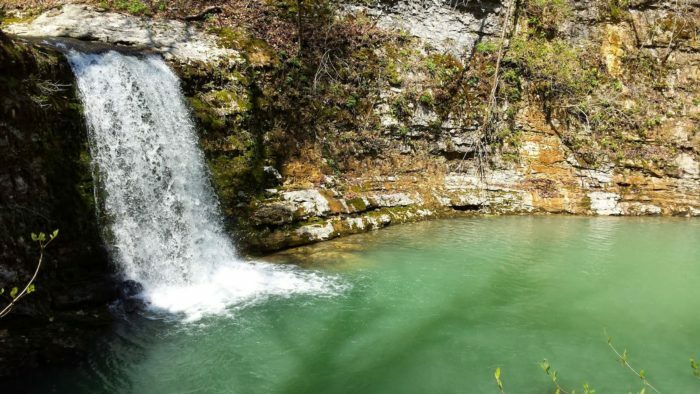 If you’d like another natural treasure hunt, take this 5-mile hike to the dreamiest swimming hole you’ve ever seen.